"It is the heart and soul of Wulfgar, ultimately, that will surface in the end. I, and anyone else, could no more influence that heart and soul than the sun itself. Curiously, it is in that celestial body that I take my comfort now when thinking about Wulfgar. Why watch the dawn? Why then, why that particular time over noontime, or any hour of daylight? Because in the dawn, the sun is more brilliant by far. Because in the dawn, we see the resurgence after the darkness. There is my hope, for as with the sun, so it can be true of people. Those who fall climb back up, and brighter will they shine in the eyes of those about them. I watch the dawn and think of the man I thought I knew. And pray that my perceptions were correct." 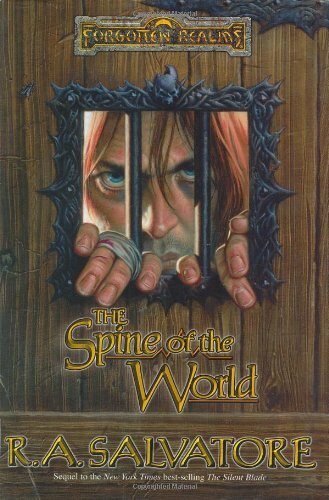 Attention all Drizzt freaks: our favorite dark-elf hero is not, repeat not, in Spine of the World. Neither is Bruenor nor Cattie-brie nor Regis et al. But don't think that means the latest installment in R.A. Salvatore's sweeping Drizzt-and-pals series isn't worth picking up: Spine sets things straight for the Forgotten Realms' newest, meanest drunk, the burly barbarian who single-handedly made warhammers cool again despite their measly 1d4+1 damage. Yep, Wulfgar is back, after ditching his buddies in The Silent Blade to become a bottle-swilling bouncer in the mangy port town of Luskan. The towering tough guy hasn't strayed from his job at the Cutlass, hasn't sobered up, and hasn't forgotten his six years of horrific torture under the nasty balor Errtu.